We did this really simple update to a plain ol’ shelf that we picked up at Target a couple of weeks ago and I just had to show you because I’m so thrilled with the results. It’s not really anything too exciting, but that’s kind of what makes it exciting, you know? It took no time at all but it really helped add a little extra bit of oomph to this corner of the dining room. So here’s how you can do a project like this yourself! 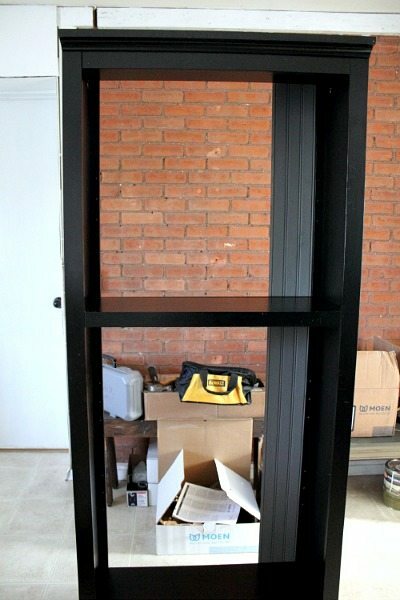 Start by putting together a basic shelving unit that you can pick up at any big box store or Amazon for cheap. Putting on the backing is always the last step. Don’t do that step! Next, run out to your local Home Depot, or other favorite hardware store and pick up one pack of basic pine beadboard. For the record, we also checked out the idea of doing beadboard wallpaper over the backing provided with the book shelf, but it turned out that the actual beadboard was much cheaper for a project this size. One pack was about $15. 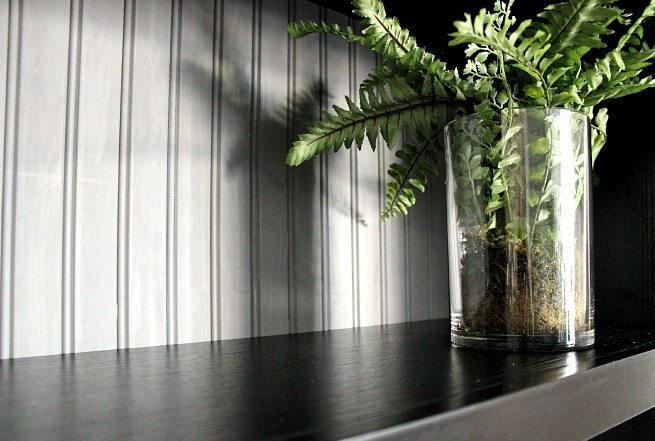 Now paint that beadboard a color of your choice! I went with a color called Dover Grey to match the dresser that we already have in the dining room. It’s a good thing I never throw away paint because I’m pretty sure that the last time I used this can of paint was about 6 years ago. 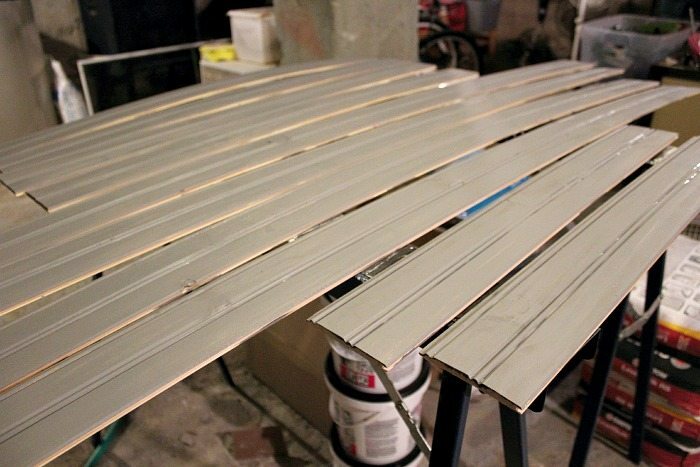 Once the paint is dry, all you need to do is just nail or screw the strips in place, one by one! Yes, that’s really how our master bedroom looks right now, right in the middle of our big bathroom reno. Classy, right? When you’re all done, you end up with something that looks like this! 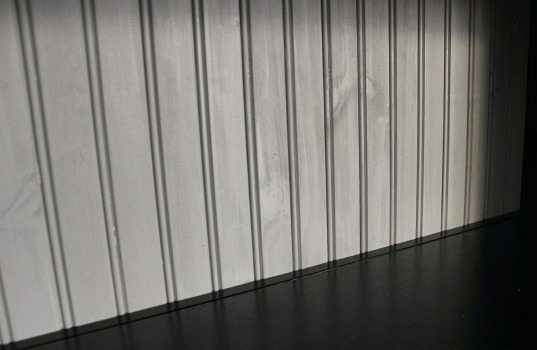 I love the depth and texture that you get from using the real beadboard. We did look into buying a really high quality shelf for this corner, but since we’re hoping to put some corner cabinet built-ins in here one day, that just seemed like a lot of money to spend for a temporary shelf that will probably end up somewhere else in the house eventually. Real grown-up shelves are expensive! This little DIY does the trick just fine for now! It’s the perfect place to put our books, dishes, and other dining room miscellany and it looks good doin’ it! 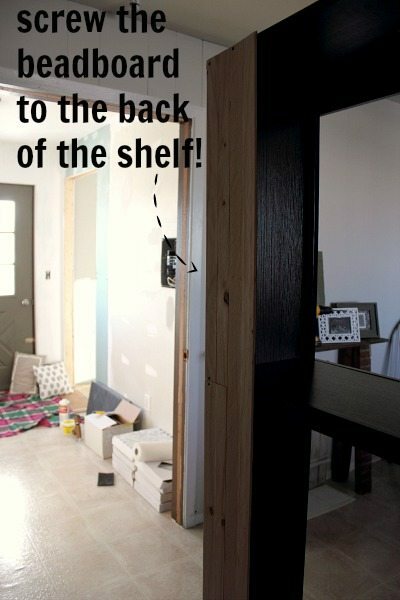 If you attempt a tall shelf DIY like this one and you have kids around, don’t forget to bolt it to the wall! 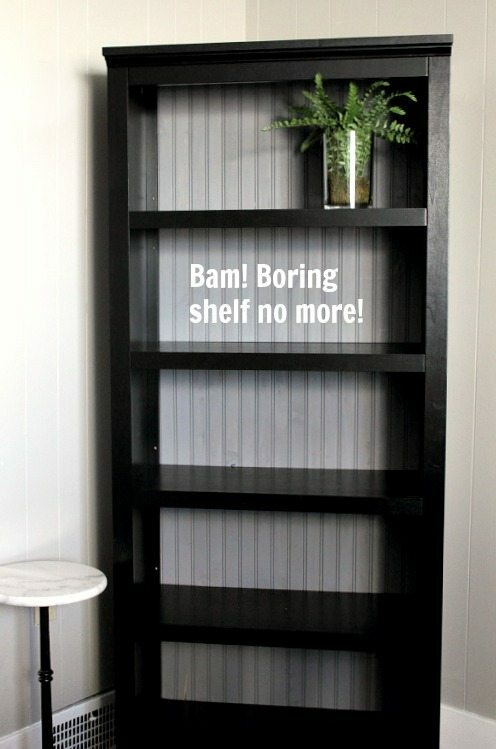 Have done anything fun and interesting to update the backs of your shelves? I’d love to hear about it! Our new wall of built-in cabinetry: A semi-life-altering storage solution! Make a DIY Baseball Keepsake from your Kid’s Old Glove! What a great alternative to those cheap back pieces. I keep paint forever too. You never know when you might need it again! Exactly! I just proved us right about that one I guess! Thanks for stopping by and saying hello, Emily!